The Texas gunman who killed 26 people and wounded 20 more at a rural church—also killed his wife’s grandmother in the massacre. The shooting at the First Baptist Church in Sutherland Springs was the deadliest church shooting in U.S. history, according to Fox News. Texas Gov. 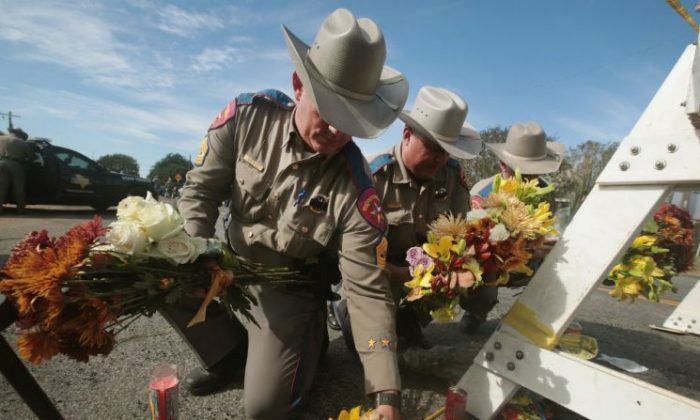 Greg Abbott has called it the deadliest mass shooting in the state’s history. Gunman Devin Kelley, killed his grandmother-in-law, Lula Woicinski White when he entered the church and opened fire on Sunday at about 11:30 a.m., New York Daily News reported. “I miss her badly already. We texted every day. We loved each other to the moon and back,” she continued. Clyburn, 74 said the whole family is in pain. “The whole family is very devastated. This is not something we ever expected. It’s just, I don’t know how to put it into words. They’re hurting a lot. The whole family is hurting a lot. I don’t know where we’re going from here. We’re going to have to take one day at a time,” she told Daily News. Clyburn said that White’s daughter Michelle Shields 54, is the mother of Kelley’s second wife, Danielle. But Clyburn declined to comment about the relationship between Danielle and Kelley, adding that she wasn’t at liberty to give any information on the topic. When asked if Kelley had threatened the family, Clyburn said, “Not that I’m aware of,” according to Daily News. White’s niece, Amy Johnson Backus wrote a heartfelt farewell post on Facebook. She wrote that she has “no doubt” where her aunt is. “I have no doubt where she is right now. She is in Heaven laying her crowns and jewels at the feet of Jesus and celebrating. I love and will miss you Aunt Lula Woicinski White,” Backus wrote in the Nov. 5 post. Also among the dead was a woman who was pregnant, the 14-year-old daughter of the church’s pastor, and an 18-month-old.